Room 11 is air conditioned and equipped with thermal regulation, has a balcony and private bathroom with hairdryer and complimentary toiletries, emergency lights, TV and fridge. The DOMUS DAMS B & B is located in Montescaglioso a few kilometers from Matera, the city of "SASSI", European Capital of Culture 2019 and Unesco World Heritage. The completely new elegant and sober structure guarantees its guests an intimate and comfortable stay. Independent and independent, on the first floor of a house surrounded by greenery, offers a fabulous panoramic view, a private garden for guests, and a terrace on the floor, where, during the hot days, guests can enjoy their breakfast at the 'open. Located just minutes from downtown: 5 min. by car, 10 min. on foot; 25 km. from the sea; 65 km. from the Bari (BA) "Karol Wojtyla" airport. The hotel has free WI-Fi and ample parking. 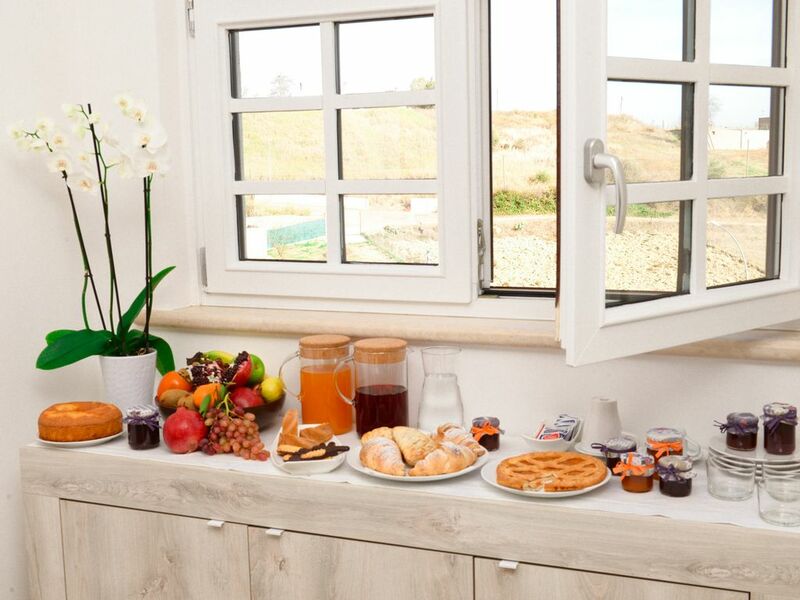 Breakfast, sweet and savory, based on healthy and genuine products, is served buffet style in the dining area, where guests have the opportunity to access at any time of the day to enjoy a good cup of tea or coffee offered by the house. Courtesy and hospitality are guaranteed. The room is air-conditioned has a tv. There is a balcony and a bathroom with hair dryers and a set of toiletries. Domus Dams is located on the outskirts of Montescaglioso. A rich town in the South of Italy, rich in history and traditons! Matera, famous for its "Sassi", nominated as a UNESCO World Heritage site in 1993 and recently awarded European city for culture 2019. The B & B is very comfortable and pleasant. It is totally independent, situated on the first floor of a house that is surronded by a beatiful garden and the countryside. It is a terrace where you can enjoy a break and admire the countryside and see horses and sheep in the fields and in the distance to the Ionian Sea. Even if the b & b is located on the outskirts, it only takes 5 mins by car and 10 mins on foot to reach the town center. Montescaglioso is only 25 km. from Metaponto or Ginosa Marina beach and 65 km. from Bari airport. The B & B has free Wi-Fi and free parking too !! Breakfast, sweet or savory, is served buffet style in the living room, where you can go anytime during the day, to make your own cup of tea or coffee. Cortesy and hospitality are guaranteed at Domus Dams B & B. The bathroom is complete in every detail including courtesy kit.